I​t's chilly outside ​in the Northeast, but spring is just around the corner, and that means it's time to bring some nature literacy and animal life cycle research to our school's library centers! Teaching ​research and information fluency skills through inquiry. ​My students are entranced by the ladybug larvae, and immediately start ​asking questions like "How come they aren't red? "​ and "​​Why they don't look like ladybugs?" With a little encouragement, they ​turn those questions into a highly engaging inquiry-based research process! ​Students observe the ladybugs in a sealed terrarium. Students take notes about their observations, and think of at least 2 questions that they are curious about. ​Then, students use library resources (both print and digital) to find the answer to their questions, and cite their sources. Citation requirements vary by grade level, but by 5th grade, ​1 or 2 complete citations in MLA format is appropriate. ​Students hand in their Ladybug Research Notebook to the teacher-librarian or classroom teacher for grading or just for feedback. Each research question could be worth 3 - 5 points: 1 point for the correct answer, 1 point for each resource (citation or just title, author, and/or web address), and 1 point for proving a resource's reliability and trustworthiness. ​​During the library class, all you need to do is walk around the room to monitor student behavior and help students who have questions about the assignment. That's probably no different than any other library class though. By staying mentally engaged ​throughout the class period, you can provide individualized support to students as they need it, and make accommodations for students with special needs on the fly. ​Ladybug Larvae Refills from Insect Lore or Amazon - I recommend ​ordering ​new larvae every 3-4 weeks. 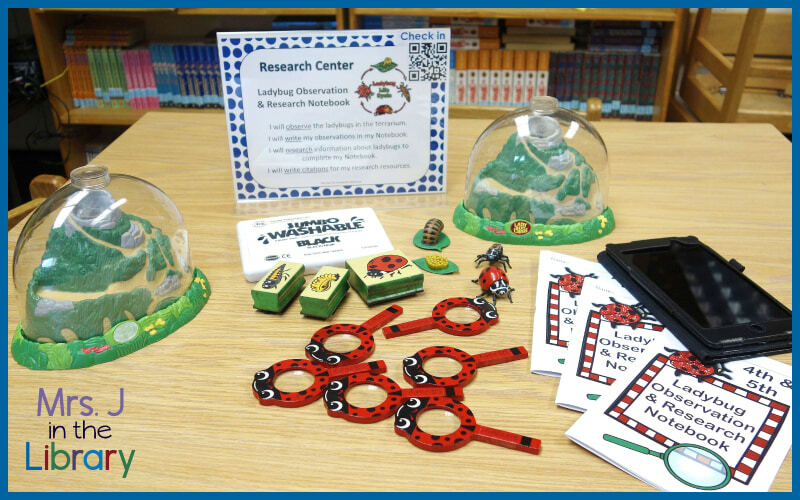 The warmer the ambient temperature is in your library, the faster the ladybugs will grow. "The Life Cycle of a Ladybug" by Colleen Sexton - ​but watch that call number! ​​Library Centers ​DIGITAL Menu / Tracker with Learning Badges - a digital way ​to track ​students' progress through a center assignment and/or keep students accountable for their center choices using Google Classroom or Google Drive. This is such an awesome idea! What a great way to make research more exciting for students! Yes, my goal is always to make things more fun and exciting, especially when teaching research. We know it’s probably not our students’ first choice for activities, so I like to make it as engaging as possible.